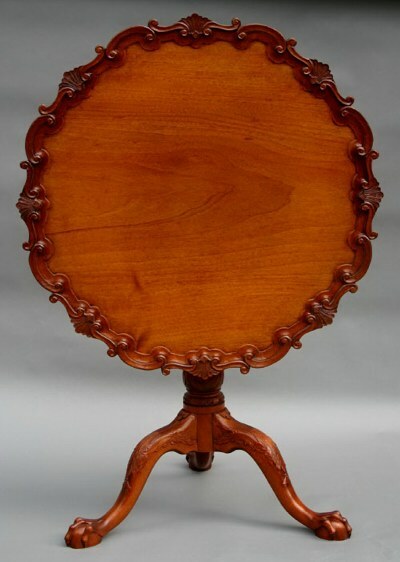 Representing the very pinnacle of carved tea table development, this tilt top tea table is a reproduction of the table in the Museum of Southern Decorative Arts (MESDA) collection. 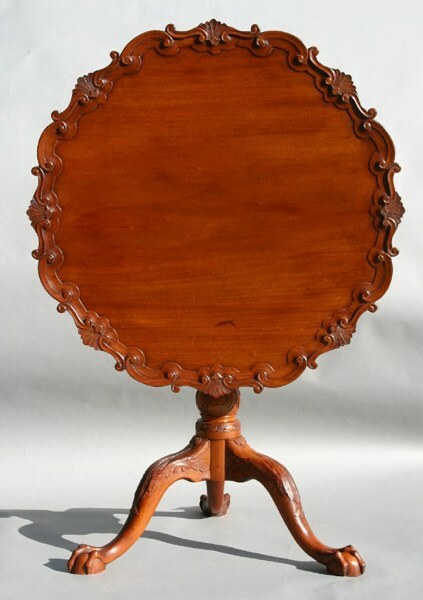 The original table was one of several similar tea tables which were attributed to Peter Scott of Williamsburg Virginia - master of the Hay shop. Recent research suggests another possible maker for the original table - the shop of Robert Walker of King George County Virginia. 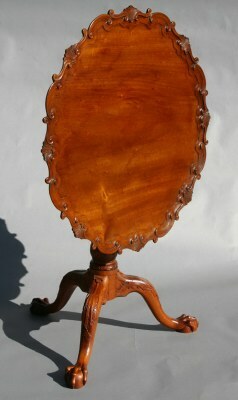 The original table is thought to have been made around 1755. 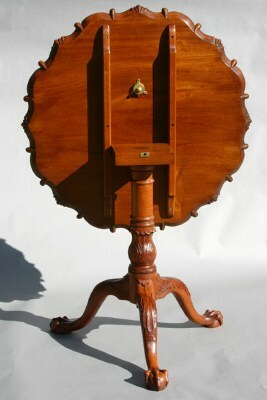 The table is constructed from solid mahogany with a reproduction brass table catch (shown in rear view). 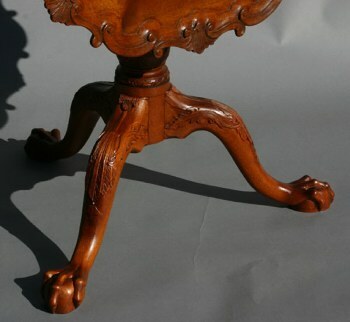 The feet, legs, pedestal and top are entirely hand carved following pictures taken from the original table. 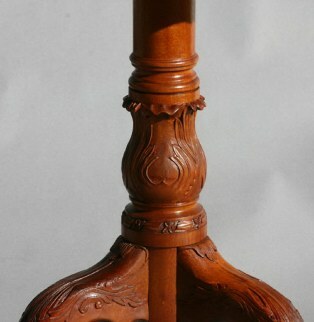 The table top is made from a single piece of mahogany which is carved out in the center to create the raised lip around the edge - i.e. 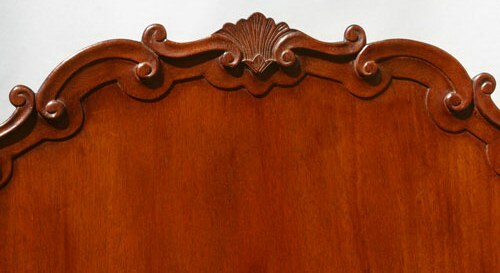 the scrolled edge is not applied it is carved from the solid. 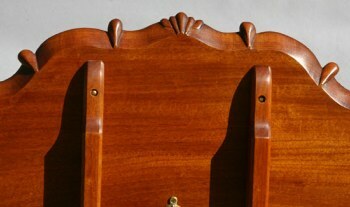 Solid mahogany top is hand carved from a single board. 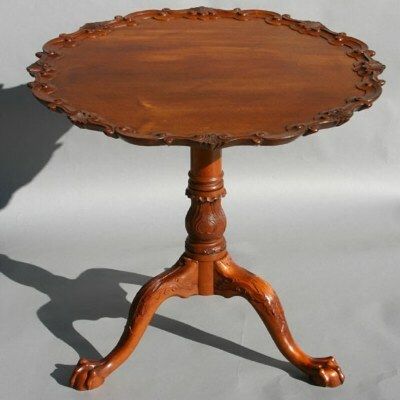 Dimensions: approximately 31.25" diameter top - 28.25" high table surface - 45.25" high to top edge of table when standing vertically. Hand carved foliage and bell flower on legs. Detail views of hand carved feet, legs, and pillar.